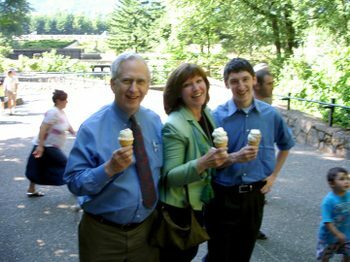 On our way to a wedding yesterday, we stopped at Multnomah Falls for ice cream. Hey, we were early and hungry and it just seemed logical. 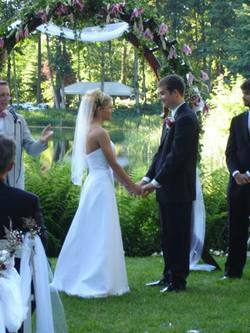 The wedding was held nearby, at a place (in the Columbia Gorge), called "Bridal Veil Lakes". It is set up for weddings, though their brochure says they are available for all occasions. Said brochure ONLY has wedding photos, however. I would certainly think this would be a wonderful place for a family reunion, too. There are canoes that one can use on the lake, too, though none of us took advantage of that. We should have, though. The wedding was for one of our neighbor's kids...Adam Cohen. He and our Adam grew up together and were pretty good friends. It was weird for Adam to think of one of his friends getting married, though. He's not even close to being there. 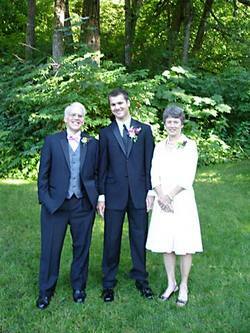 The groom's parents, Jaimie and Sherry Cohen, are pictured here, with their son. They are the best sort of neighbors, fun, interesting, involved in the neighborhood, and they keep their house and garden looking just beautiful. The bride and groom seemed totally besotted with each other...pretty good for having been together for almost 4 years already. Everyone who knew them both testified to the fact that they were totally devoted to each other's happiness. One of the relatives said, "To find one's soulmate so early in life is a blessing indeed." And everyone seemed to agree with that, too. We had a Democratic House Party here last night. Some of the folks who came, I knew, and others were strangers but it was great. We had Neil Pender, the Executive Director of the Oregon Democratic Party, who was our special speaker. I cooked up a ton of spagetti, garlic bread, and salad. We went through bottles and bottles of wine. We talked about how we hoped to change our state and our nation for the better. Onward, democracy! The big blowout bash for my coffee buddy, Irene, was last night. Everything was excellent...all the way from the margaritas/lemondrops/sangria to the fabulous food to the wonderful company of good friends. We had Adam drive us and then he was on-call to pick us up at the end of the party. 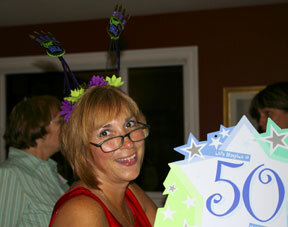 What a way to celebrate turning 50!